Exactly two years ago Scott and I ran a marathon. Yes. 26.2 miles. The training was painful. Physically. Mentally. And totally time-consuming. We basically dedicated our lives to running. That's not easy with two small kids. Julie was 5 and Johnny was 2. Though it was difficult, sometimes boring and we often wanted to quit, it was our thing. Our bonding. There's not much more that brings a couple closer together than running 20-plus miles together every weekend. We talked a lot. We listened to music. We helped each other and we motivated each other. Scott finished every run by saying "Push it. Sprint." And, even though we had run for hours, we would both sprint and give it our all at the end. After our runs, we would high-five, and drive to the local sandwich shop to treat ourselves to subs, chips, Gatorade and a huge frozen coffee drink. Six months of intense training and then we finished the Marine Corps Marathon in D.C. What a feeling. But, after we finished, we were done. That was it. We had spent so much of our time running that we were convinced we wouldn't run another race any time soon. Scott started biking. I went back to the gym. That was that. Then, last Saturday Scott had the idea to get a babysitter and run along the Lake Michigan Trail in downtown Chicago. It's a beautiful trail. Every time we're downtown with the kids we talk about running along it. So we did. Not too far...probably six or seven miles. But, it was a good run and we were together. Who knows. Maybe the Chicago Marathon 2014 is calling our name. 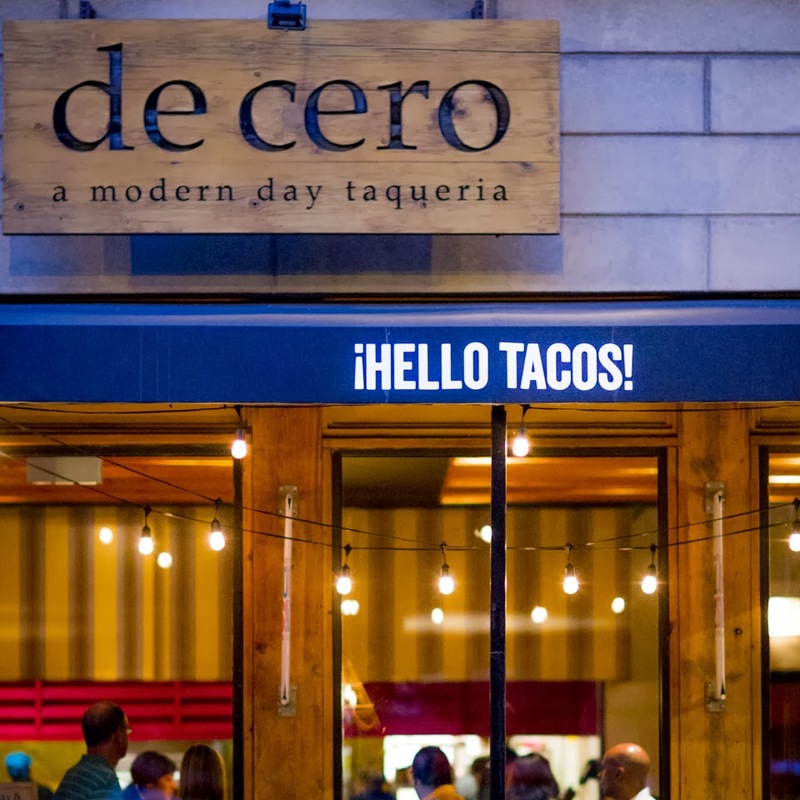 "De Cero" means "from scratch," and De Cero Taqueria lives up to this translation. 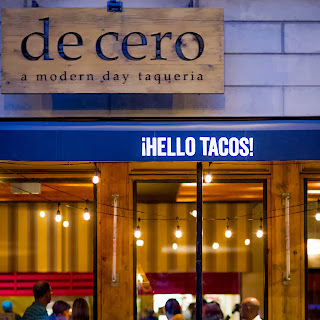 Located in a trendy stretch on Randolph Street in West Chicago, De Cero serves up small, but tasty bites. Scott and I stumbled upon the place while out for a date day in the city. We were actually looking for a barbeque restaurant, but Scott made a wrong turn and ended up driving past De Cero. It must have been fate because I was secretly longing for some Mexican. We ordered a couple margaritas. Scott's mango chile margarita was a bit too thick for his liking and he would have rather opted for a more refreshing drink, but he was glad he tried. My passion fruit margarita was tasty, but I've had better margaritas. The food, however, was fresh, unique and delicious. We devoured the duck nachos, tamales and fish tacos. We weren't quite prepared for the tiny portions, so we weren't completely satisfied. We left wanting more, which means we will be back! It was the day Julie had been anxiously awaiting--a trip to Shedd Aquarium in downtown Chicago to meet and pet a real penguin. A couple years ago Julie decided her favorite animal was a penguin and she hasn't changed her mind. So, for her birthday we decided to surprise her with a special Penguin Encounter at Shedd. What made it even more special was her Aunt Kelly adopted a real penguin from Shedd for Julie. She named him "Flimmer" and couldn't wait to meet him. Though we didn't actually meet the penguin Julie adopted, the Penguin Experience was still amazing. Scott, Julie, Johnny and I were among a group of just eight people to meet a penguin named Sparrow. 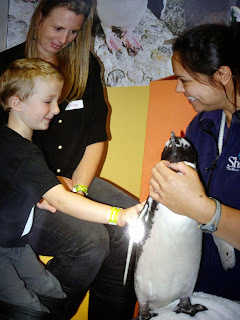 The shockingly tame and calm penguin walked around our feet, and we each pet and took pictures with the penguin. Julie seemed to be in a state of disbelief. Both of my kids were reprimanded in the same week for being a tad too social. I kind of expect it from Johnny. He's such a little goofball that I wasn't shocked when his teacher told me that Johnny was "being silly" with his friends and was rushing through his work. Julie came as a complete surprise. She used to be my little wall flower--the little girl who would kick and scream at the mere mention of play dates. The one who would cling to my side and whine to go home when we were in a big group of kids. The information came home in the form of a progress report. A little dash appeared next to "speaks at inappropriate times." Say what?? Apparently our shy little girl is "quite social" according to her second grade teacher. She finishes her work quickly, so there is sometimes downtime when she turns and talks to her "best friends." She has three little best friends, and every day she brings home a letter or drawing from another kid in class. The other day a little girl wrote her a note "Julie you are a really nice girl. It's no wonder you have three best friends. If you ever need anything I am here for you." I can't say I haven't noticed Julie's social urges, but It all kind of snuck up on us. I guess I always assumed she'd be a little shy like I was when I was at her age. Though I had friends, I was completely intimidated by big groups and I would throw up at the thought of speaking in front of class. I am so relieved Julie didn't inherit the shy gene--or at least not to the extent that I had it as a young kid. I have to say I'm a tiny bit pleased that Julie has become Miss Social. I love that she's comfortable and happy at school, and she has some good friends. That doesn't mean she escaped a "talking to" by Scott and me. But, secretly we were just glad our little girl was doing well in school and loving it. I'm a sucker for history. I just love exploring old places and daydreaming about who might have lived, walked or met there. So, when I heard about Twin Anchors in Chicago, I was all about it. 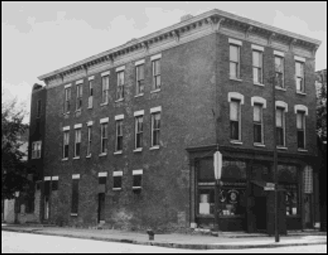 It's one of the oldest restaurants in Chicago, and is situated in the Old Town building built in 1881. Since 1931 it has been Twin Anchors, a pretty famous barbeque joint, considering Frank Sinatra used to frequent the place, and the restaurant has been the scene of a few movies. Though I wouldn't say the food is excellent, Twin Anchors is worthy of a visit. 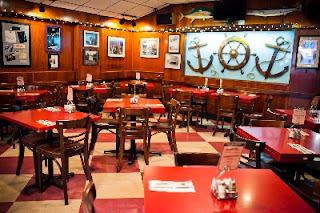 With its old school tavern charm and nautical theme, Twin Anchors has a fun atmosphere, and you can't but marvel at its history. It's pretty much an obligatory part of Fall. Considering I'm a sucker for all things festive, I'm all about visiting a pumpkin patch or two or three before Halloween. Chicagoland has plenty of great pumpkin patches. When my parents were visiting a few weeks ago, we tried out Didier Farms in Lincolnshire. It's a bit carnival-like and a tad expensive, but of course the kids had a blast. I mean they rode a camel, chowed on hot dogs and apple cider doughnuts and fed birds in a huge cage. What's not to love? After picking out the pumpkins, the kids washed and scrubbed them in a basin set out just for that purpose. There of course were hay rides and mazes and plenty of places to run and play. Two thumbs up from Julie and Johnny. Saturday is usually try a new restaurant day, so off we went in search of a new place to eat. We thought about being festive and eating at a German restaurant in honor of Oktoberfest. But, lines were too long at Hofbrauhaus in Rosemont, so we went across the street to Fogo de Chao. I had never heard of this amazing smorgasbord of salads and meats and everything delicious. 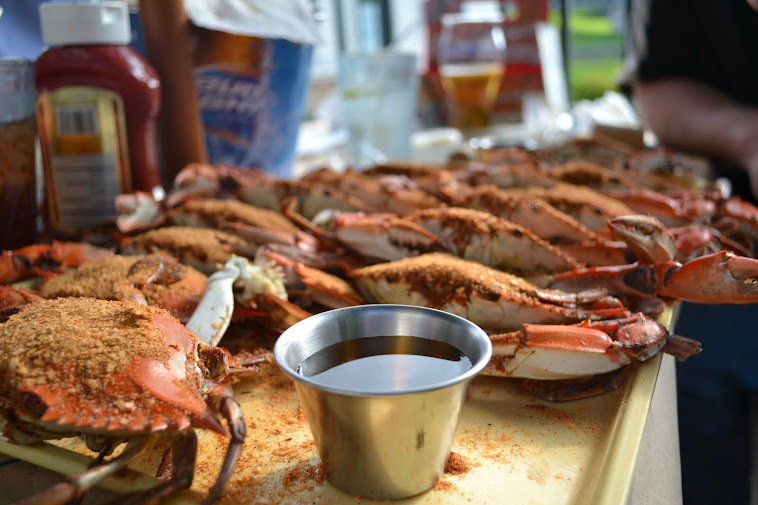 But, my big-eater husband of course had eaten at the chain while living in Maryland. He was practically drooling when he set eyes on the restaurant, which just recently opened in Rosemont. The place is not for the light eater. Meals are $46 for adults and $23 for kids. We quickly decided we would be dining without the kids if we returned to Fogo. Despite the hefty price tag, the meal is truly an experience. I'm going to use the word "salad bar" but please don't picture wilted lettuce and cottage cheese. 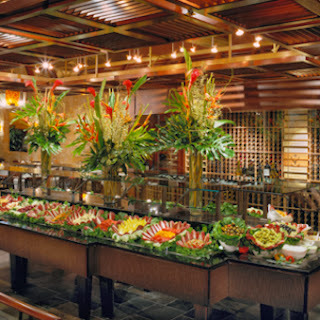 This is a gourmet bar with meats, cheeses, vegetables and salad fixings. Smoked salmon, prosciutto and fresh mozzarella were my favorite choices. The highlight of the meal is of course the fresh meat, which is brought to your table by dozens of waiters, wielding skewers and knives ready to cut off your ideal slice of beef, lamb, chicken, steak, whatever looks best. The chicken osso buco and lamb were my favorites. Along with the never-ending array of food were hot sides of cheesy mashed potatoes, hand cut French fries and fried bananas, as well as rolls. We definitely didn't leave hungry! Every time my parents visit from Maryland they are amazed at how much Chicago has to offer. This time we ventured to Morton Arboretum in Lisle. It was on my summer to-do list with the kids, but we just never made it out there. With my parents here, it was the perfect to make the trek. We were not disappointed. There were dozens of hiking and biking trails, but the Children's Garden was our favorite---with rope bridges, garden mazes and secret passages. The fall is an excellent time to visit the changing leaves and pumpkins. Following a one-mile trail along a small lake, we admired the scarecrows and chose our very favorites. The café was decent---soups, salads, sandwiches, and adorable little brown bag lunches for kids. On weekends in October the arboretum offers fall festivities, and during the holiday season there illuminated holiday hikes, and other activities. Overall a great place to visit! My mom and Johnny navigating a garden maze. I walked timidly into the office holding my trembling bundle of fur. It stunk. The receptionist scowled at my whimpering pup. She smugly shoved a list of fees into my naïve hands, as I pretended to not look completely horrified. I know I'm new at this whole dog thing, but someone please explain to me in detail about the pressing need to neuter animals who live in decent homes. I understand we don't want a litter of unwanted pug puppies running around Lake Zurich, but it's highly unlikely this scenario would play out with our puppy who we never let out of our sight. Besides, pug puppies are cute, right? Then, I know there's the issue of behavior--- the removal of manhood is bound to calm a dog. So, those are the pluses. 1. My poor puppy is completely bruised and battered down there. 2. It's gross. Seriously. I can't even look at it. 3. I think my dog hates me now. 4. I just paid $150 for superfluous extras plus the $65 I paid for the cheap Friends of Animals neuter certificate. I know you're going to say you paid $600 for your dog's neuter. Did I mention I'm cheap? 5. My puppy stinks and I can't give him a bath. 6. I have been forced to define "neuter" in G-rated terms. 7. My kids keep asking "What's wrong with Chico's hiney?" I love jewelry, but I rarely splurge. I usually stick to fun, costume pieces. But, Scott was so sweet and bought this awesome silver watch from Mondavo. I love that he took the time to pick out something special for our 10th anniversary.